Poker Hall of Famer Carlos Mortensen called a bet of 700 on a board reading 7 6 5 8 . The river brought the 4 , and Mortensen’s opponent fired 3,500 this time. Mortensen thought about it briefly before making the call. The small blind player tabled the K 3 , while Mortensen flipped over K-9 for a straight that was better than what the board had. He was up to around 30,000 thanks to the hand. Registration has officially closed for the Card Player Poker Tour Wynn Classic main event. We will have final numbers and prizepool information shortly. There was a small rush to the cages just prior to the break and we saw Zo Karim, Keven Stammen, Dan O’Brien and Kyle Julius among the players buying in at the last moment. We’e also spotted David Randall, Ben Yu, Eli Elezra and Carlos Mortensen in the field. Matt Berkey is back for round two today as well. 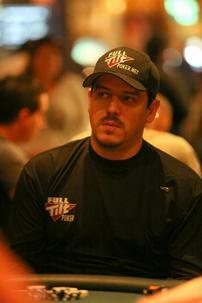 Carlos Mortensen, winner of the main event in 2001, was still alive after the fifth day of play here in the 2013 World Series of Poker no-limit hold’em championship. Just 68 players remained out of a starting field of 6,352 entrants. The 41-year-old Spaniard ended the day with 2,665,000, which was slightly below average. Mortensen could be the first former champion to make a final table since Dan Harrington, winner of the main event in 1995, did so in 2004. Mortensen is considered by many to be the most successful player of all-time if you factor in the number of events played. He has more than $10.8 million lifetime in winnings. He also wins nearly 20 percent of the time when he cashes and lays claim to 22 titles on the circuit. Day 5 also marked the end of the line for defending champion Greg Merson. Merson hit the rail in 167th place. He was short when he lost with A-2 versus A-K. The Maryland native failed to outmatch the performance of Peter Eastgate, who finished 78th the year he was playing in defense of his title. 89. Annette Obrestad — $71,053; 90. David Paredes — $71,053; 99. Marvin Rettenmaier — $59,708; 118. Ashton Griffin — $50,752; 131. Max Steinberg — $50,752; 176. Kyle Julius — $42,990; 226. Greg Mueller — $37,019; and 228. Amit Makhija — $37,019. Steinberg was once the chip leader, but he became short after a hero call gone wrong. Yevgeniy Timoshenko — 4,065,000; Jackie Glazier — 4,045,000; David Benefield — 3,675,000; Noah Schwartz — 3,595,000; Michiel Brummelhuis — 3,485,000; J.C. Tran — 3,280,000; Amir Lehavot — 2,655,000; Mark Newhouse — 2,035,000; Jim Collopy — 1,970,000; Bryan Pellegrino — 1,795,000; Sergio Castelluccio — 1,655,000; Tyler Cornell — 1,465,000; Vladimir Geshkenbein — 1,400,000; Steve Gee — 1,360,000; Andrea Dato — 1,130,000; Vitaly Lunkin — 1,000,000; Rep Porter — 950,000; Benjamin Pollak — 740,000; Byron Kaverman — 700,000; Brett Richey — 690,000; and Simon Ravnsbaek — 600,000. Glazier could be the first woman to make the final table since 1995. Everyone is chasing Sami Rustom, who ended the day with 7,005,000. Rustom hails from California and had just $42,000 in career earnings prior to this main event. NOTE: Three blind levels will be played each hour, as each is just 20 minutes long. The only difference in round 3 is that the blinds begin at 600-1,200. NOTE: Day 2 Will Continue Until the Conclusion of the Sweet 16 Round, which will begin at 8 p.m. this evening. The field decided to take a 15-minute break at the end of hour two so the hour three update will come in at 6:15. Starting Stacks: 300,000 broken up into three chances â€” meaning that the players started with 100,000 and had 200,000 additional on the side that they could add on at anytime before a hand. If their additional chips were not in play when a hand begins, those chips couldnâ€™t be used to wager with. Carlos Mortensen was knocked down to 100,000 when he moved all in with Q J and John Duthie made the call with K 5 . The board ran out K J 7 5 3 and Mortensen was down to his final reload chip. A few hands later it was all over for Mortensen. Mortensen was all in again, this time with pocket deuces and Duthie had him covered with pocket queens. The board stayed out of things, running off J J 10 9 6 and Duthie became the first player to advance to the sweet 16 and make the money. He ensured a cash worth at least $67,436. Ashton Griffin got the last of his chips into the middle against Tom Dwan and when they flipped over their cards â€œDurrrrâ€ was way out in front with pocket aces over his opponents pocket fives. The aces held and Dwan was the second player to advance to the sweet 16. Maxim Lykov faced another decision against Matt Marafioti with the board reading K K 6 2 A and 50,000 raised out on the table after Lykov opened the action for 16,000. Lykov decided to call and then he mucked his cards when Marafioti flipped over two black aces. Lykov was down to less than 100,000 after the hand with no reload chips. There was close to 50,000 in the pot and the board read 10 6 6 10 3 when Carlos Mortensen bet 25,000 from the hi-jack on the river. Kyle Bowker thought for a moment and then slid out enough chips to put Mortensen on a decision for his tournament life. He pondered the decision for a few minutes but eventually mucked A 6 face up in the middle of the table. Bowker then revealed the K and the J as he collected the pot to grow his stack to more than 150,000. Sam Trickett was all in holding A-9 against the Q-10 of Carlos Mortensen. The board ran out K-K-6-J-A and Mortensen made his straight to advance. Carlos Mortensen moved all in on the short stack holding A 6 against the A K of David Oppenheim. The board fell Q 8 4 2 2 and Mortensen was eliminated. Oppenheim moves onto the sweet 16 for the second year in a row to face Eugene Katchalov. DeWitt was eliminated in ninth place and he will take home $94,800 in prize money. Mortensen continued to grow his stack and he now holds 5 million. In a strange turn of events Mortensen won the hand and he knocked out two opponents in the same hand. They each take home $63,410 after Jesse Yaginuma busted on the same hand at the other table and took the field down to the final nine players. Details on that hand will follow soon. Carlos Mortensen raised to 200,000 from the button preflop and Vivek Rajkumar made the call from the small blind. Gregory Brooks also made the call from the big blind and the flop fell J 5 3 . Brooks hit a fifth club on the river to win the hand with a flush. Mortensen was eliminated in third place and he will take home $640,680 in prize money. That makes Brooks the dominating chip leader heading into the final match. 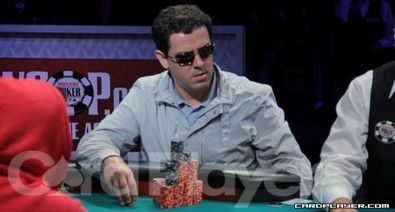 Fish was eliminated on the hand in sixth place and he will take home $235,530 in prize money. Mortensen grew his stack to 4,730,000. A few other players who have hit the rail as the field plays down to the dinner break include Andy Bloch, Carlos Mortensen, and Richard Ashby.